What to keep and what to toss from Marie Kondo’s "The Life Changing Magic of Tidying Up"
When January 1 rolled around this year I knew that meant two things: an influx of memberships to Planet Fitness and the release of the new Netflix show ‘Tidying Up’ with Marie Kondo. I cared more about the latter and I was excited to watch. I read her book The Life Changing Magic of Tidying Up back when it was released in 2014 and my love for tidying has never ceased. I love a good tidy. I am an organizer. Sorting, editing, and rearranging are second nature to me and many of the methods in The Life Changing Magic of Tidying Up are tactics I employ on a daily basis. After binge watching the series and flipping through the pages once again, it renewed my love for so many of her methods, but there are a few that I will still unapologetically leave out of my routine. Any good tidy has the two essential categories of ‘what to keep’ and ‘what to toss’ so in tidying up fashion, here are my Keep/Toss piles for The Life Changing Magic of Tidying Up. The major mantra of the KonMari method in The Changing Magic of Tidying Up is to only keep what sparks joy. Marie says to only keep what speaks to your heart and discard the rest. On the show ‘Tidying Up’ she expresses this feeling as a high pitched buzzing sound with an ecstatic smile. It is hard not to feel joy when watching her! She is clearly full of it. I think the idea of keeping what sparks joy is a great concept to apply to every area of your life. Fill your life with things, people, and experiences that spark joy. However, in terms of practicality, it can be a little tricky to decide if an item brings you joy. In that case I like to do a little ‘joy calculation.’ Example: My heart doesn’t flutter for my snow boots. But, when it is crazy cold and I can not only feel my feet, but they are cozy and warm, I feel awesome. So circuitously, snow boots = Joy. Some people may say the idea of only keeping what sparks joy is unrealistic. There are things we use in our daily lives that are purposeful and necessary that don’t specifically fill you butterflies. True, but I would argue that the overall principle is about positivity and creating more opportunities for joy in your life, and that I can co-sign. File folding lets you see everything in a drawer at once, and looks great color coded! Marie Kondo knows what’s up when it comes to folding clothing and there are plenty of YouTube video tutorials with her demonstrating She says that ‘by neatly folding your clothes, you can solve almost every problem related to storage’ and I’m inclined to agree. If there is one thing you can do to change your clothing organizational game, it’s to file fold. A file fold is when you fold clothing into a neat little pack and store it vertically standing up, rather than horizontally stacked one on top of another. This allows you to see exactly what you have at any given moment, and takes practically no more effort than your previous folding method (assuming you had one). Try this! You will be a convert. In her book, Marie Kondo expresses the importance of communicating love to our clothing and has particularly strong feelings about socks and hosiery. She says they should never be folded or balled because they ‘need to rest’ and that balling socks up can ruin the elastic and stretch them out over time. I do think when we respect our belongings it shows respect for ourselves, and while the look of file folded socks is quite lovely, I’m not going to do it for myself. To me, part of being organized is about finding ways to functionally improve my life, and spending time folding and arranging my socks isn’t one of them. In terms of stretching them out, okay fine, that may happen. But, I also put socks in the category of clothing that needs replacing more often, because, feet. Perhaps not pinterest perfect, but my socks are stored in bundles by type. Nothing unravels when I grab a pair and they seem well rested to me. In The Changing Magic of Tidying Up, Marie lays out a prescribed order of operations for tackling tidying and she saves sentimental items for last. This allows you to become more discerning about what actually brings you joy before handling your most sensitive material. Saving sentimental items for the end of a declutter can help you navigate the pitfalls of going through emotional items by having had more practice with decision making. If you try to dive straight into a seriously emotional pile of belongings, you may be paralyzed by the prospect of getting rid of items you aren’t ready to unload, and then you make no progress on anything. Me, wearing a sweatshirt, feeling great, and brushing up on my KonMari method. In The Changing Magic of Tidying Up Marie encourages the idea of always wearing something we feel good in to promote positive self image. She mentions that women should try and wear elegant things to bed and that it’s not very attractive to look like you belong in a sweatsuit. I am all about presenting yourself in a put together and polished way, but I can wear a sweatshirt and still have a positive self image. I am literally wearing one now and I feel great. I don’t need to wear a negligee at bedtime to feel good about myself. That’s not to say that I don’t love a cutie little PJ set, because I do! But, I do not conflate my self worth with my sleepwear. Besides, there are some really cute sweats out there these days. Athleisure is in, Marie! Ultimately, Marie Kondo says that if you follow your intuition, all will be well. If you are overwhelmed by clutter and are ready to change how you live, it can truly impact all areas of your life. This mantra is meant for the journey of getting organized, but could easily be applied to all aspects of life. Our belongings are intimate reflections of ourselves and deciding how and when to let go of certain things is truly a personal choice only you can make. Because the experience of going through your belongings is inherently emotional, you may find hiring someone to lead you through the process helps. Calling in some reinforcements will only enhance your efforts and help you feel supported when it can get challenging. A professional organizer is like a personal trainer for your space and you’ll get better results with accountability and guidance from an expert. An actual text I received on this very topic. Marie says that tidying should be considered an event, and if you declutter everything all at once in a short period of time you will radically change your mindset and never need to tidy again. Ok - I fully endorse the concept of treating tidying like an event. Giving the process dedicated time and energy will absolutely improve your ability to maintain new organizational setups. However, the idea that you will never need to tidy again seems unrealistic to me. Backsliding happens! Different life events call for different systems and you may need to go through your things again every once in a while. Organization is a lifestyle, not a destination. It takes ongoing effort to live an organized life, and like any lifestyle choice, sometimes it requires maintenance. 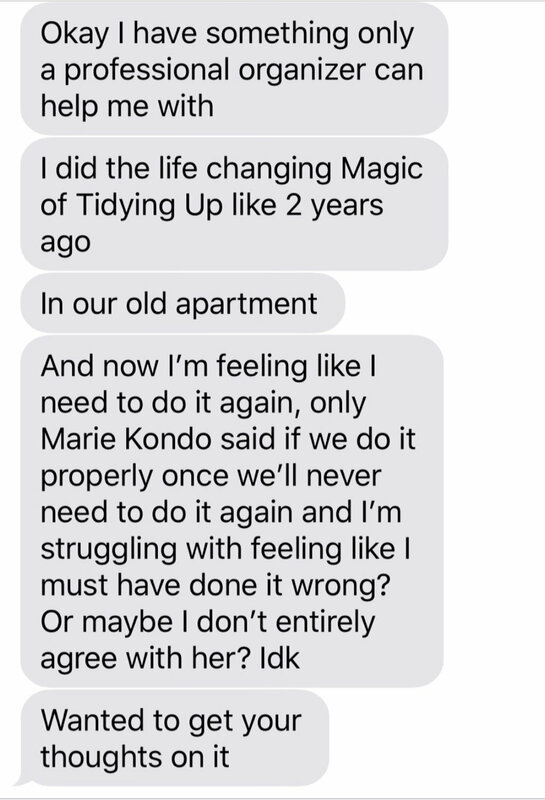 There may be a few sticking points that I don’t subscribe to (I don’t greet my apartment), but overall Marie Kondo’s book The Changing Magic of Tidying Up on the KonMari method is a breezy read filled with nuggets of organizational wisdom and great advice (you may just want to keep the bits that work for you and toss the ones that don’t). Regardless, if you are thinking about tidying up, you should start by picking up this book.